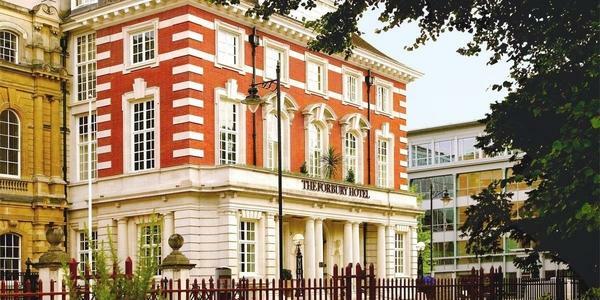 Located on a quiet corner of the town centre overlooking leafy Forbury Gardens, The Forbury Roseate Hotel in Reading is unashamedly opulent and stunning. This Edwardian former Shire Hall for Berkshire County Council has been lovingly transformed into an ultra-stylish and welcoming boutique townhouse hotel. The original features within this Reading hotel have been meticulously restored, including cornice mouldings, vaulted ceilings, wood carvings, gilt work and even the original lift shaft, now home to an amazing chandelier made from 86,000 Italian glass beads. The smallest details are perfectly thought out, from fabrics and lighting to designer rugs and wallpaper. The art throughout is extraordinary, including 19th century Impressionist landscapes to leading contemporary artists, and every bedroom displays specially commissioned sculptures. All bedrooms are fully equipped with king size beds, Egyptian cotton sheets and duvets, walk-in showers, under-floor heating, state-of-the-art Bang and Olufsen audio-visual systems, Molton Brown toiletries and Nespresso coffee machines. The Suites are exceptional with four-poster beds, copper baths in the centre of the room, a private dining table for six and separate living room. The Fobury Suite and, especially, The Penthouse are particularly spacious and resplendent. Downstairs, the Cerise Restaurant continues the motif of chic and stylish surroundings. The kitchen serves up traditional English cooking with modern twist made from locally sourced ingredients. An all-day bar menu is also available, and the same attention to detail which goes into creating the décor finds its way into the cocktails – try a specialty G&T or one of the sublime martinis. For special occasions, three private dining rooms are available, including the lavish Eden Room, once the original council chamber, with its imposing fireplace and elaborate wood carvings. In warm weather, drinks can also be enjoyed under the shade of the pomegranate tree in the Moroccan-themed Secret Garden. If you’re looking for a romantic getaway or luxurious weekend away in Reading, the Forbury Roseate Hotel is the perfect location and has all you need to discover Berkshire and the surroundings. Don’t miss your chance to book this stunning hotel in Reading and be sure to take a look at our special offers and discounted rates.